Fish Sticks Lunchbots Bento, a photo by sherimiya ♥ on Flickr. Remember those perfectly rectangular fish sticks from elementary school? Do they still serve those? I've never made them at home, but I saw this oven-baked version of fish sticks and decided to try. I used cod which I cut into strips, coated with egg and seasoned panko, sprayed with oil and baked in a 425F oven until golden. I also baked some diced purple potatoes under the rack of fish at the same time, and we also had kale chips (which we ate for dinner; no leftovers). 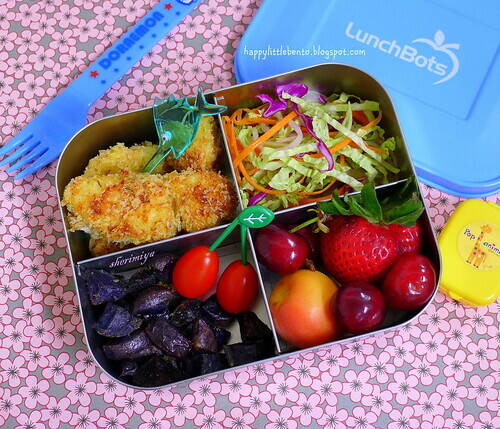 I packed the LunchBot Quad with vinegary cabbage carrot onion daikon slaw on the side, and a selection of springtime fruit: cherry tomatoes, cherries, apricot and strawberry. Mmmm fish sticks! I haven't had fish sticks in a long time. They look really good :) We haven't had any good cherries here yet, but I'm on the lookut! Cherries are exploding over here these days. I bet you'll get them verrrry soon.